Posted by Maria Perilli on July 31, 2014. Here at PPC Professionals, we utilize pay-per-click (PPC) advertising as well as search engine marketing (SEM) to increase our clients’ business and bottom-line profit. On the home front, we are heavy users of social media and are constantly publishing new online content, like industry related news for example, so finding an efficient content management tool that is able to keep up with our digital marketing efforts is crucial. The perfect content organizer must meet our standards in certain components, such as the tool’s ease of use, its user interface design (needs to be pretty, please), if it allows for team collaboration and if it supports multiple social media platforms. A couple of weeks ago we stumbled upon CoSchedule, a WordPress plugin featuring a drag-and-drop editorial calendar for your entire social and blog post organization needs. As an avid user of Hootsuite, this was a much different scheduling style than we were used to, but with an enticing free 14 day trial we had nothing to lose. 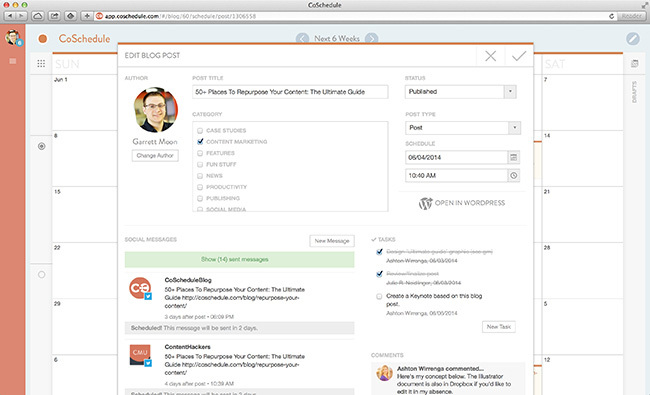 As mentioned, CoSchedule is a plugin within WordPress letting you schedule social media messages simultaneously with your freshly written blog post. 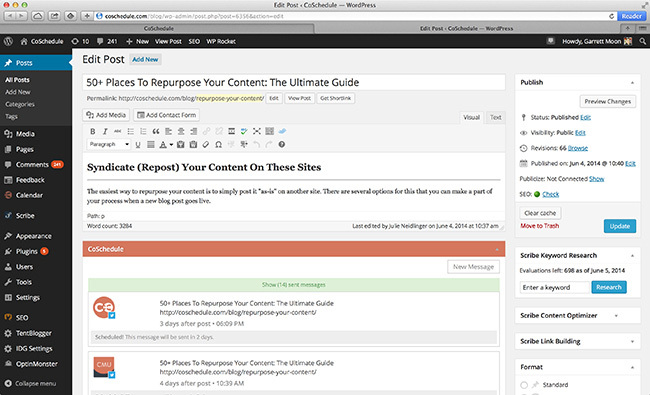 It’s nearly impossible to miss scheduling blog promo messages because it’s all in one place. This can also help with staying on topic by posting relevant content to tie in with your writing. CoSchedule supports six different social media platforms including LinkedIn, Buffer, Google+, Facebook, Tumblr and Twitter, and allows use of more than one account on each. You can schedule social messages far in advance (for example, next month) and pick the exact time or time frame you’d like them to go out. Not to mention the published result of each message is professional and clear, no ugly url written out in the link preview area – just text and an image. How it should be! You can also gain insight into how well your social media posts are doing with ‘Social Mentions.’ View who mentioned you and see the reach of each message. CoSchedule does not take the place of your chosen method to interact with followers and fans of your social media streams, though. You will still need a method for that (i.e. Hootsuite or Buffer). Another perk, CoSchedule’s easy-on-the-eye design. Setting up multiple social messages on various platforms and keeping track of blog post dates is hectic enough, the last thing anyone wants to look at is another confusing cluster of items. We’re fans of the soft coloring and clean design of the tool, making using the plugin easy and painless. CoSchedule also makes collaborating with a team possible by allowing comments on scheduled tasks and reminders helping keep everyone on track with deadlines. Its content calendar format with drag-and-drop ability makes re-organizing items a breeze and helps in situations when a team member has a different opinion on when an item should be scheduled. Simply plant a draft blog post title on the selected date and begin outlining your month ahead of time. This is a great attribute especially for planning content that requires approval ahead of time. Leave any item in draft mode and wait for the OK. Smooth collaboration is made possible by CoSchedule!